The PUMA Bantam is a beautiful, versatile PUMA Pocket knife. The PUMA Bantam is a rugged, classically styled PUMA pocket knife. A small, light German knife designed for heavy work, this model is easy to slip into your pocket every time you head out into the woods. And would be an excellent knife for experienced outdoorsmen and boys who are just picking up their first pocketknife. It's a simple knife with two blades: a 2-3/4" spearpoint and a 2" spey blade. Both blades are forged from D1.4 Cutlery Stainless Steel, which has a Rockwell Hardness of 57-59. These tough blades hold up well under repeated use and will not need to be sharpened frequently, even when they are working hard. The blades fold into a 3-1/4" handle that can easily fit into a boy's pocket, which makes this a good knife for Boy Scouting trips. However, it is still tough enough for a man to use comfortably, making it a nice choice for anyone who needs something for small jobs around the campsite. 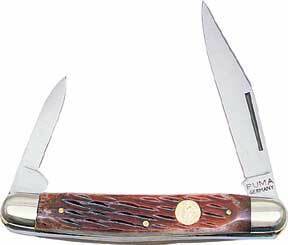 The handles come with staghorn, bone, or olive wood scales, making the PUMA Bantam easy to hold and very attractive. An ideal knife for boys learning how to take care of a pocketknife, the Bantam is a simple, durable knife that they'll treasure for years to come. It's also an excellent pocketknife for an outdoorsman who wants something small and light to carry with him for those jobs that don't require a large blade. Convenient, rugged, and designed to last for a long time, the PUMA Bantam is a knife you'll be happy to take wherever you go. Return from PUMA Bantam to the German-Knife.com home page.